Khan Resources Inc. (“Khan” or the “Company”) (CSE:KRI) announces that, consistent with its preferred strategy of reaching an amicable settlement with the Government of Mongolia, a second series of meetings with representatives of the Government has now been completed. These meetings took place in Ulaanbaatar on April 21 and 22, 2015. The Company has repeated its request for full and prompt payment of the award. The Company intends to vigorously pursue obtaining value for shareholders. In conjunction with this intention, the Company will commence a complementary initiative for enforcement and collection of the award in the countries that are signatories to the New York Convention. The Company has retained the services of specialists for assistance in this matter. With regard to the international arbitration, Khan has been notified by the Tribunal Secretary from the Permanent Court of Arbitration (PCA) that the arbitration proceedings were terminated with the issuance of the Tribunal’s Award on the Merits on March 2, 2015. After completing its final accounting, a small reimbursement was provided to the parties by the PCA. 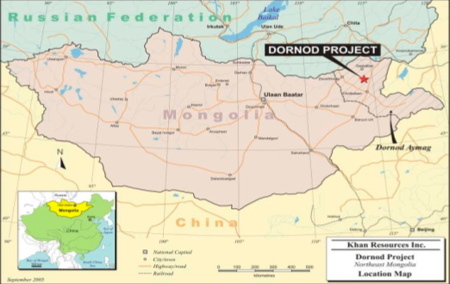 On March 2, 2015 the international arbitration tribunal rendered an award to Khan as compensation for the Government of Mongolia’s actions in relation to the cancellation of Khan’s uranium licenses in 2009. The award consisted of a Base Amount of US$80 million plus interest at LIBOR +2% (compounded annually) from July 1, 2009 to the time of payment. In addition, the Tribunal awarded costs of US$9.1 million in favour of Khan. As of April 23, the award aggregates to approximately US$104 million. Interest is currently accruing at a rate of 2.546% or US$6,485 per day.